Hi, I have irrigated horse pastures which are miserable right now for the horses due to face flies and small biting insects (maybe no seems). What would you recommend for applying that would be safe for horses to graze on? We have dry heat 90-100 degrees in summer California. The barns are fine and have spray system but I’d like to get the pastures under control. Fly traps don’t work at all. Thanks Cathy M.
Face flies can be controlled with two products that are labeled for use on horses and cattle. Both can be sprayed in the pastures too which is needed to cut down on the local breeding cycle. 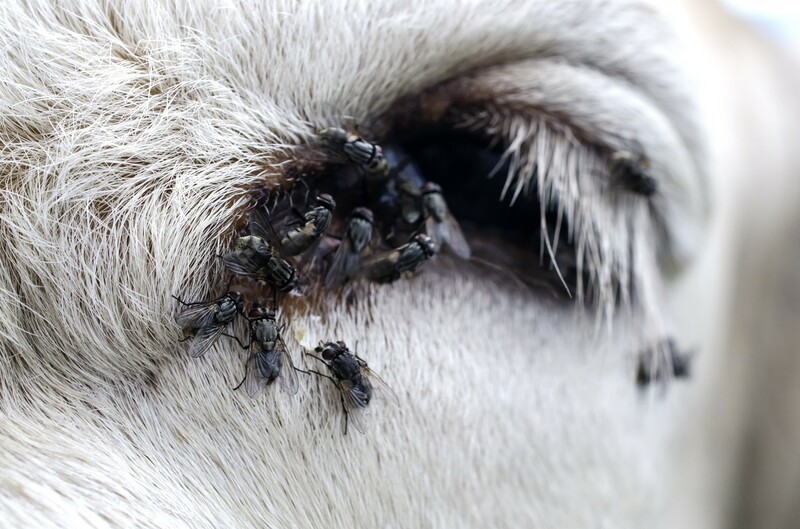 In case you don’t know, face flies spend most of their lives in manure. So if you are recycling manure, this would be a key site that should be treated. And if you’re leaving the manure out in the pastures; these areas should also be treated. Additionally, any shaded or moist areas where biting pests like noseeums, mosquitoes or other biting flies may be breeding should also be treated. Lastly, treating the horses directly is also suggested. When done properly, this type of face fly biting insect pest management program will help cut down on the amount of flies attacking and biting. Ultimately this will help your horses have a more comfortable summer. Currently there are two products labeled for this exact application need. The first is what we consider to be a “green” organic option. Made with food extracts and essential oils, ESSENTRIA IC is a federally exempt product that will handle biting flies, face flies, noseeums and other pests commonly found around cattle and horses. It’s labeled for use around water like ponds and lakes so it won’t pose any hazard to such areas on your farm. It can be applied as a spray or mist so you can treat the pastures where these pests are no doubt breeding. And it’s also labeled for use on horses so you can treat them with it directly. As a dip, mix 3 oz per gallon of mineral oil and apply to affected animals as needed. As a fog, use 4 oz per gallon and expect to spray every 10-14 days depending on the life cycle of the pests on your property. Treatments can be done more frequently at first to get things under control and you should plan on using 2-3 gallons of mixed material per acre. This would not pose any kind of hazard to the horses or other animals but I would keep them away from the areas being treated until the treatment dries. The second option is PERMETHRIN 10. This would be more of a traditional pesticide but it’s odorless and labeled for the same application sites as the Essentria. Permethrin will handle all the same pests and because it’s a bit “stronger”, treatments will no doubt last longer. Expect to get 1-2 weeks of protection per application; longer once the local population of these pests is reduced. 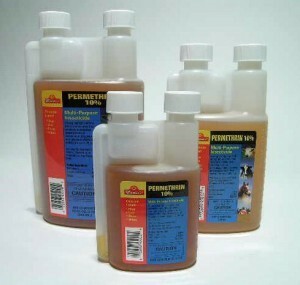 Like Essentria, Permethrin is labeled for use on horses and other animals at the rate of 6 oz per gallon of water. Use 4 oz per gallon in the fogging machine if you want to mist it instead of the Essentria. Its odorless and will provide a longer lasting residual but I would still plan on treating every 10-14 days. Both products can be applied with any kind of PUMP SPRAYER, but when treating large open areas, the use of a ELECTRIC FOGGER or BACK PACK MIST BLOWER will make the task a lot easier. And you’ll save in chemical costs too since both devices will enable the coverage of the chemical you apply to go a lot further compared to liquid spraying. So if you have 1/4 acre or more to spray, go with something like our FM6208. It holds a gallon of mixed product and will pump out 30-40 feet making short work of 1/4 to 1/2 acre lots. 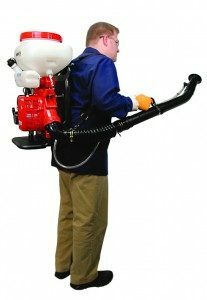 But if your property is an acre or more, invest in a Back Pack Mist Blower. These units are gas powered and hold 3+ gallons of material so you can treat independent of electric lines. The Hudson is a good entry level machine plenty powerful for 1-3 acres and will pump a mist 30-40 feet.